ETYMOLOGY: The genus Marina was named by the Danish botanist Frederik Michael Liebmann (1813-1856) who made several botanical collecting trips to Mexico and the Caribbean. 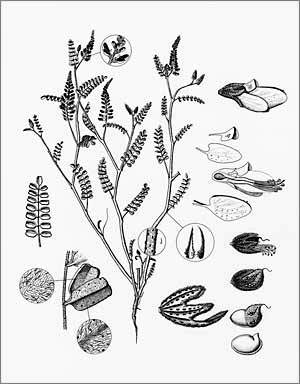 In 1853, Liebmann published the first description of the genus Marina, which he named for Doña Marina, the Aztec woman who served as interpreter to the conquistador Hernán Cortés. The species name honors Charles Christopher Parry (1823-1890), a physician and botanist who served as a member of the U.S.-Mexico Boundary Survey and the Pacific Railroad Survey along the 35th parallel. He was one of the most respected botanists of his time. The 2" compound leaves have several pairs of 1/4" green leaflets with reddish margins and are dotted with glands. Half-inch flowers grow in spike-like clusters to 4" long. Petals are purple or dark blue above and white below. The seed pod has two rows of glands on each side.